What’s buzzing at The Hive? | Thoughts – HEY! What’s buzzing at The Hive? I am very proud of our new learning hub, The Hive, and at its official opening last week, I shared in a speech my thoughts on why it is not just an eye-catching building but will soon become an icon of the future of learning. Not your regular modular building stacked up like Lego bricks, it redefines university buildings with its unusual shape and use of space for learning in the 21st century. The Hive was named by students in a HEY! naming competition. 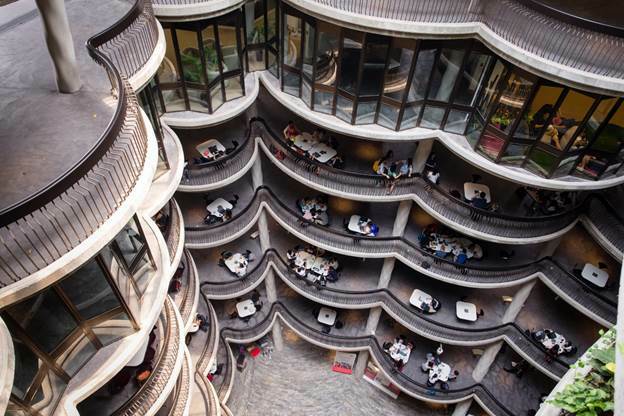 They felt the building resembles a cluster of elongated bee hives. I expect The Hive to be abuzz with student activities both day and night! 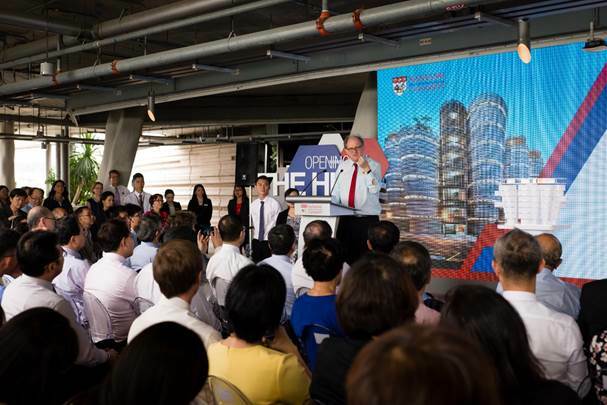 The Hive, with 56 high-tech classrooms for collaborative learning and student interaction, plays an important role in supporting the new pedagogies that NTU is driving, such as the flipped classroom and team-based learning. In education, we are going from Gutenberg to Google and the next-generation professor is Professor iPad or Professor Smartphone. I was amused when shown a Facebook post recently. Kid, 6: When people die, do their souls go to heaven? plants and soil and so on. Kid: Go Google it first, then let’s talk. Digital devices and online media have changed the way we acquire knowledge. You can now learn your course content from your smart devices so that facetime with your professor and classmates can be put to better use by thoroughly examining and applying your knowledge of the topic. NTU’s smart classrooms have flexible clustered seating designed for active small group discussions. Gone are the traditional rows of tables and chairs in classrooms, so be prepared to debate and defend your ideas in class. With multiple LCD screens around the curvilinear rooms, no one will block your view, and wireless communication tools beam your ideas to all these screens instantly. In deciding to put up with 30 months of dust and noise to build The Hive, we had envisaged it would be a hotspot for students from all disciplines. The building’s open design inspires a free flow of ideas. Students can enter from different directions, and since there are no entrance doors, the building can be accessed 24/7. I joked about how an engineering boy could meet a business or humanities gal, or a science girl could meet a medicine guy. So there you could fall in love, found a start-up, file the next research patent or raise funds for a social cause. There’s no telling what’s next for you, our future inventors, social entrepreneurs, young CEOs of start-ups, and who knows, future Ministers! So, see you at The Hive, and keep it abuzz with ideas, debates and fun! 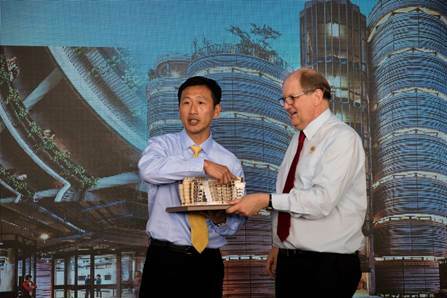 Presenting a 3D-printed model of The Hive to Acting Minister for Education Mr Ong Ye Kung at the official launch of the building. This entry was posted in Campus Life, Education, Events, Learning, Miscellaneous, Professors. Bookmark the permalink.